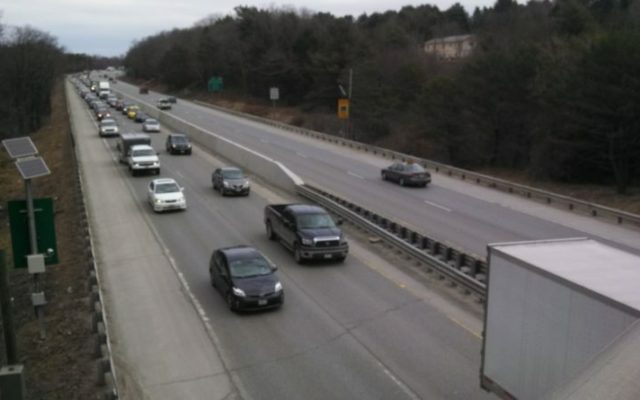 Nick McCrea | BDN Traffic backs up in the southbound lanes of Interstate 95 in Bangor in September 2018. Good morning from Augusta. After the inauguration of Gov. Janet Mills, Maine has been participating in -- but has not formally joined -- a regional effort that could produce a cap-and-trade system aimed at lowering vehicle emissions, the region’s largest source of carbon pollution. Good morning from Augusta. After the inauguration of Gov. Janet Mills, Maine has been participating in — but has not formally joined — a regional effort that could produce a cap-and-trade system aimed at lowering vehicle emissions, the region’s largest source of carbon pollution. The group could produce a policy by the end of 2019 and there’s a basic idea of what it could be, but Maine has a unique set of concerns. Vehicles remain Maine’s largest and most intractable source of carbon emissions from fossil fuels, which fell by 30 percent overall between 2004 and 2015, according to state data. That was largely because of decarbonization in the electricity industry, whereas transportation emissions stayed largely flat over that period. In 2015, those emissions made up roughly half of all carbon emissions in the state. In Massachusetts, they made up 40 percent, according to WBUR. Nationwide, they only made up 28 percent of total emissions. That general problem has pushed states in this direction. The states, meanwhile, can use the revenue for energy efficiency and other programs. Maine has gotten $94 million as of last year and most of that money goes to Efficiency Maine, which runs weatherization and rebate programs for efficient heating systems and appliances. Hannah Pingree, the director of Mills’ innovation office, said officials from the state’s transportation and environmental protection departments have participated in two meetings. But she was cautious about the negotiations, saying the state is “monitoring it” and has made no decision about joining. Most legislative committees will vote on bills today, on topics that include the sale and accessibility of renewable energy, including microgrids, instituting an elver fishing quota, addressing sea level rise, and securing state funding for school-based health centers.